Maryland Pink and Green: Lilly Pulitzer resort sale! Hello blog friends! It's a windy and cold morning here in Maryland. All the more reason to think about Lilly Pulitzer's gorgeous resort line. I've got some great scoop for you today!! Persnickety Palm is having a special 2 day sale today and tomorrow. Fall and holiday are significantly reduced, but the big news is that EVERYTHING in the store is 30% off. 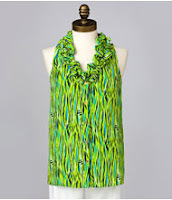 This includes the uber popular Murfee scarves and all resort deliveries. Linda, the owner of Persnickety Palm, is so sweet and would love to help you find some special Lilly. This morning, I picked up another Murfee in Shorely Blue Grand Scale Access to add to my growing collection. There are lots of Murfee scarves in stock in Lilly's pink, Daiquiri pink, and Bright navy grand scale access. These scarves are flying out of stores quickly, so get yours today at an amazing price! 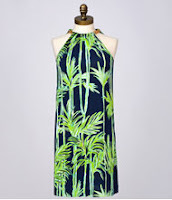 The store also has the last delivery from resort in stock and it is TDF! The Lara dress is a silk jersey that is so flattering and comfortable. The Reena top is a piece that works even in the frigid Maryland winters. I love it paired with the navy Shere sweater. Take advantage of this great sale today and let Linda know that you saw the sale on my blog. You can reach Persnickety Palm at 703-443-0948. I am happy you found some great goodies! any Meg Carter goodies I can not live without? I am so wondering if I should have gone to the sale? Were the scarves 30 percent off? Hi there! The scarves were 30% off and so was the latest resort delivery. EVERYTHING was at least 30% off and fall was more. There are second markdowns on some kids stuff and fall, too. Sadly, I didn't see the Palm Beach Meg Carter necklace I've been watching, but there were a lot of earrings, etc. It's a great sale. Thanks for the great tip, I love the Lara dress! Amy~ So glad you found a Murfee and a tunic. Isn't Linda so sweet? I <3 her! Hope that everyone was able to "spave" at this great sale!